It’s always a good day when a new book on ganseys appears, and that’s what popped through the letter box on Saturday. 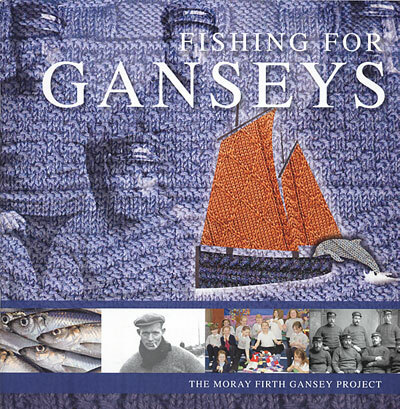 There’s a couple of chapters on the project, another on the fishing industry along the Moray Firth, and there are instructions for knitting their new “Beatrice” gansey design. 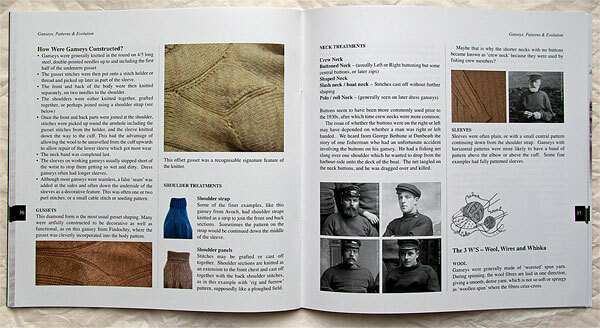 But the heart of the book is the chapter on “Ganseys, Patterns and Evolution”, which is full of old black and white photos and colour photos of knitted ganseys. Quite a few of these haven’t appeared in print before to my knowledge, so the MFGP has done us all a service by making them available here. My only disappointment is that they haven’t charted out the patterns. This feels like something of a missed opportunity but, as they say, the point is to encourage you to try charting them out yourself (and, to be fair, some the photos are clear enough that even someone like me could probably manage it). So here I am, just half an inch or so from starting the cuff. So I’ll probably finish the sleeve this week and make a start on the other one. I’d hoped to finish the gansey around Easter and I won’t be far off, I think, if I knuckle down. I’ve maintained a steady decrease down the sleeve (after the gusset) of 2 stitches every 6 rows; I also use that as the sign to move the stitches round on the needles to stop a line of uneven stitches at the joins developing. Gordon, many thanks for the information concerning Fishing for Ganseys. I have ordered it just now :). 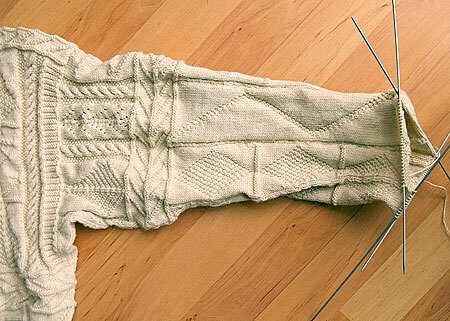 The cardigan is progressing every week, I wish that my sweater would progress that fast. Today in Helsinki: Morning 21 Celsius below 0. Be happy you are in Scotland . Thanks from me, too, for the link to Fishing for Ganseys, I have ordered my copy and had a nice e-mail conversation with Kathryn Logan. 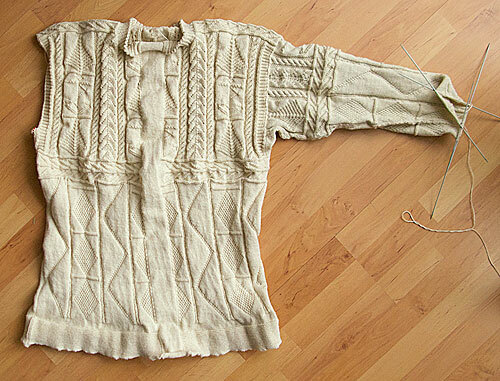 I like the design you’re taking down the sleeve – what a relief that must be for you after such a detailed yoke! I am now on the yoke of mine and love the design plan. I also changed to 2.25mm needles (from 2.50 of the body) so those yarn overs aren’t huge holes. Brrr in Helsinki! it’s 10C in sunny British Colombia. Judit, I had a day off midweek to recuperate and it was amazing how much I got done, just a day to knit and chill out. Heaven. Lynne, the only downside is, I now have to steel myself for the detailed top part of the sleeve again, and I’ve already forgotten what I did! Good luck with the pesky yarn overs. A still day here today, cloudy but bright, about 7C. So, yes, I’m grateful to be in Scotland! Hi! I’m so glad you’re feeling better. I’ve bought a copy of that book; I’m working up to making a gansey myself and I love research materials. I picked up the book as soon as I could – having been at Ganseyfest, I had an idea how good it would be. Very pleased with it. In other news, my gansey is languishing. This looks great, thanks Gordon. The Gansey that is in my head is looking good! I’m about to order the wool for it. The museum tries to pretend it’s a flower pot, but no one is fooled by that! Freyalyn, before I did this blog, my ganseys frequently languished for weeks and months at a time. It’ll still be there later on. Nigel, so when they said you had wool between the ears, they meant …?! What colour are you going for? OMG, Gordon, that’s exactly the pattern I’ll be using. It’s great, isn’t it? 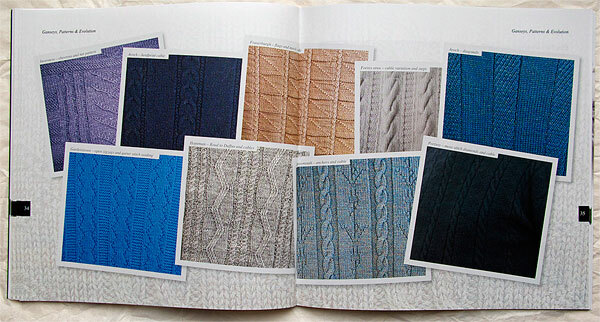 I’ll have to find something equally silly to use with it – some unusual cable or lace pattern. I love that fish skeleton, too, I think I’ve seen a smaller version in one of the gansey books but this larger one is really impressive. I have never done the shoulder strap that continues down the sleeve before, and Gordon is a great resource for that, but the Moray-Firth Gansey project has put a couple videos on You Tube for any other readers who are interested. My only concern with the skeleton is that you’ll be followed wherever you go by hungry cats! 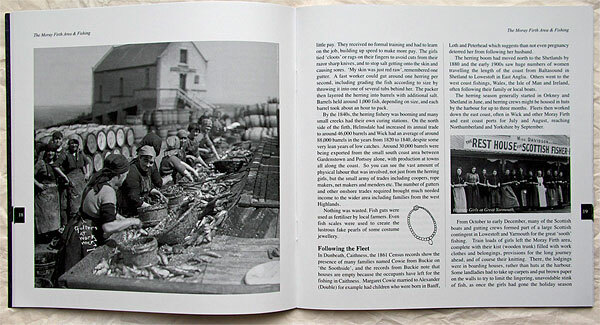 I just received my copy of Fishing for Ganseys here in the US. What a treasure it is! Thanks for recommending it. I ordered it immediately upon reading your post about it. I see also that you get a mention on page 43. Very nice!